Jerry and Kimberly Cronin can sympathize with the biblical patriarch Job. Six years ago, the Perkasie couple had a promising future: a new baby, a home of their own, and a rapidly growing business. Faith was central to their lives; Jerry had been assessed for the permanent diaconate through St. Charles Borromeo Seminary in Wynnewood. At age 31, he was told he was a fit, but was advised to wait until his startup company was more fully established. A born entrepreneur, Jerry threw himself into providing for his family and his staff. Then everything came crashing down, after a sequence of work-related injuries ultimately paralyzed Jerry. Today — after multiple infections, procedures and financial setbacks — the Cronin family has found an even deeper faith in God, thanks to the support of their parish, their friends from Archbishop Wood High School and archdiocesan Catholic Social Services. The son of a custom homebuilder, Jerry had worked extensively in construction and industrial hygiene. He opened a roof cleaning business, naming it in honor of the Trinity, and developed an innovative cleansing product. “We doubled our sales for the first three years,” said Jerry, now 38. Pain was part of the job for the six-foot-four Cronin. Despite a doctor’s concern, Cronin soldiered on, focused only on his family and his workers. In March 2014, Jerry — already battling hip and back pain — was struck by a toppled 30-gallon barrel. He slogged through another week of work until he picked up a piece of plywood and felt a pop. By the next morning, he had lost feeling in his legs and was unable to walk. Emergency decompression surgery resulted in a grim prognosis: cauda equina syndrome (CES), characterized by massive damage to the horsetail of nerves at the base of his spine. The falling drum and the plywood had dealt a decisive blow to Jerry’s back, weakened by multiple, long-ignored injuries. Meanwhile, Lyme disease ravaged Jerry’s joints and his neurological functions. “My brain was just going downhill like crazy; my memory was horrible,” he said. As Jerry’s health declined, the Cronins struggled to hang onto their business and their house. Even a simple trip up the stairs was a challenge; without a lift, Jerry had to be dragged up “like a wheelbarrow” by his wife. “God has his way of laughing sometimes,” said Kimberly, a reading specialist for the Bucks County Intermediate Unit who is assigned to St. Isidore School in Quakertown. Their belief in God, along with practical assistance from the area’s Catholic community, have enabled the Cronins to rebuild their lives. Jerry and Kimberly credit each other with nurturing a mutual faith that has sustained them over the years. Mass and Eucharistic adoration, as well as fervent devotions to Mary and St. Padre Pio, are vital to their spirituality. Worldwide Marriage Encounter and the Unbound ministry program offered through the archdiocesan Office for the New Evangelization have also been sources of insight and grace. Immediately after Jerry’s accident, the couple’s former classmates from Archbishop Wood High School rallied around them. 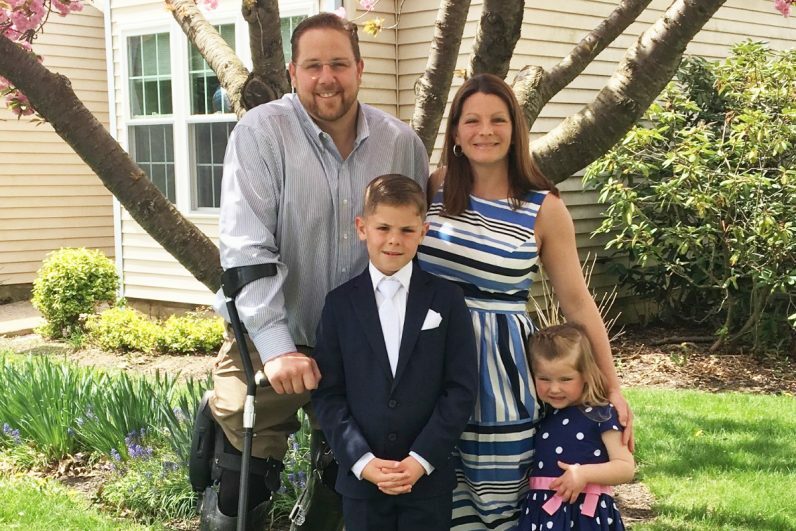 Family and friends organized a beef and beer that raised $19,000 toward the $165,000 cost of Jerry’s robotic leg braces, which now enable him to walk approximately 100 feet at a stretch. Just before he received the braces, Jerry read the day’s Scripture, a passage from John’s Gospel in which Christ commands a paralytic to “rise, take up your mat, and walk” (Jn 5:8). The couple’s parish, St. Jude in Chalfont, has responded to the family’s needs in a manner that has been “just amazing,” said Jerry. The Cronins attribute the energetic outreach to St. Jude’s implementation of Christ Renews His Parish (CRHP), an acclaimed pastoral renewal program. The parish’s St. Vincent de Paul Society purchased an outdoor scooter, which enables Jerry to move about more freely over longer distances. Mercy Sister Elizabeth Marley, the parish school’s principal, “worked miracles” to assist with tuition for the Cronins’ two children, Grady and Gianna. Donna Cushing, wife of permanent deacon Mike, created a GoFundMe campaign to assist the couple in purchasing an adaptive car that will allow Jerry to drive. Another parishioner bought the couple a motorized bed, since Jerry must now sleep upright to prevent choking and fluid buildup. And when the family had to move, almost two dozen people from the parish arrived on a Saturday morning to assist. The parish’s clergy were equally supportive, spending hours with the Cronins and even contacting archdiocesan Catholic Social Services (CSS) to seek additional assistance for them. Teri Mitchell, administrator of CSS’s Bucks County Family Service Center, visited the family and was touched by Jerry’s “humble, kind and faith-filled” determination. “The meeting forever left an imprint on my heart and faith,” said Mitchell, who was able to secure two months of rental assistance for the Cronins during the summer months to help ease the financial burden of extremely high medical costs. The Cronins continue to face their ongoing challenges with confidence in Christ and in his church. On Feb. 5, Jerry will undergo brain surgery to alleviate a nerve condition that triggers severe facial pain. After recovery, he will continue his studies through Pennsylvania’s Office for Vocational Rehabilitation, which supports persons with disabilities in gaining employment. Both Jerry and Kimberly have allowed God to transform hardship into holiness, a lesson they hope to share with others. Jerry is quick to place his pain in the context of the cross. Such a humbling and inspiring story. Thank you! !